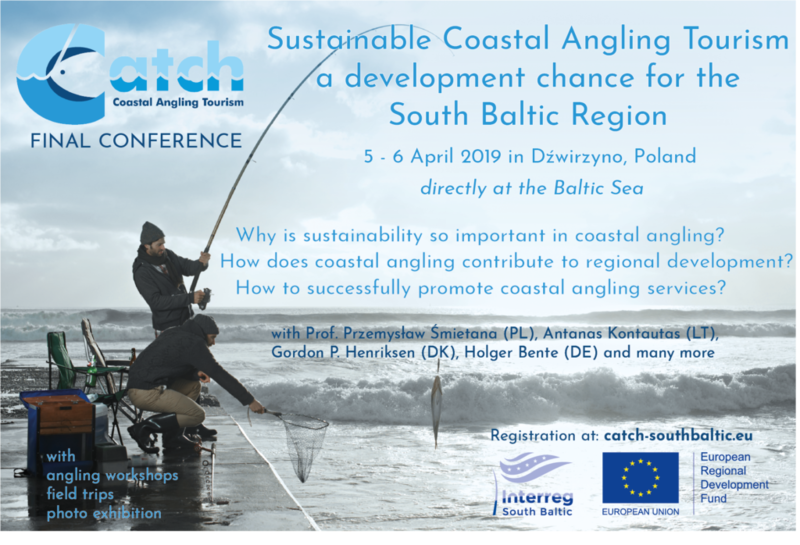 The CATCH Consortium and the Organizing Committee are pleased to invite you to the final conference of the Interreg project CATCH Coastal Angling Tourism – a development chance for the South Baltic Region, to be held in Dźwirzyno, Poland on Friday 5th and Saturday 6th April 2019. Angling experts and partners from Denmark, Poland, Lithuania and Germany will present a rich program of current trends, offers, local initiatives and marketing opportunities for sustainable coastal angling in the South Baltic Region. Best practices and guidelines for communities to raise the potential of regional coastal angling tourism will be discussed. With parallel practical workshops, a gallery of the winner photos of our photo competition and the opportunity for posters, the conference will also be a vivid platform for exchange and networking. Please also visit our new multilingual platform at www.fishingsouthbaltic.eu – your website for the next fishing holiday! with information on best fishing spots, lodging alternatives, fishing guides, boat rental services and more. Simultaneous English-Polish and Polish-English interpreting will be provided for the conference. For registration, agenda and more organizational information, please visit further sections. To register for the conference, fill out the form below and return by email to anetak@gajanet.pl. The attendance is free of charge, but please note that places are limited and will be allocated on a first come first served basis. Should you have any questions, please do not hesitate to contact Aneta Kozłowska – anetak@gajanet.pl, mob. +48 512 015 041. Hotel and travel reservations should be made ONLY after receipt of written registration confirmation. If you have not received your confirmation within five working days, please contact us at anetak@gajanet.pl. All cancellations must be in writing; replacements by colleagues are much welcome. Please, note that all fields marked with an asterisk of the registration form are mandatory and that the name and affiliation you give here will be printed on your badge and the participants’ list. sustainable use of fish stocks. A board of 120 cm (width) x 90 cm (height) will be accepted for a poster. The A4 format copies added to each poster would be very welcome. Poster abstract should be emailed with the registration form to jakub@gajanet.pl. The deadline for abstract submission is 25th of March 2019. The conference Sustainable Coastal Angling Tourism – a Development Chance for the South Baltic Region is organized by the CATCH project Consortium. The local organization is carried out by the Green Federation “GAIA” in cooperation with the Faculty of Biology, University of Szczecin. Should you have any questions, please do not hesitate to contact Aneta Kozłowska, anetak@gajanet.pl, mob. +48 512 015 041. The Conference Dinner is being held on the evening of Friday 5th of April, from 19:00. It features a delicious seated dinner with traditional Polish cuisine and is a fantastic way to spend your Friday evening and great opportunity to meet other participants. The Conference Dinner will take place in the Hotel SENATOR restaurant. Come as you are. All participants are invited! The trip program includes demonstration of activities of voluntary fishing guard on the Parsęta river. The guards will present and discuss the specifics of their work and specialized equipment to fight with poaching, like photo trap, thermal imaging camera and night-vision devices. Another visited place will be the hydroelectric power plant on the river Parsęta in village of Rościno. A newly built fish pass with a scanner for monitoring fish migration will be demonstrated. The number of places is limited, first come – first served rule applies. Lunch-box included. All conference sessions (both plenary and poster presentations), photo-exhibition and interactive coffee breaks, will take place in the HOTEL Senator. The conference venue is located at Wyzwolenia 35 St., the main street of Dźwirzyno. Dźwirzyno is a village in Kołobrzeg County, West Pomeranian Voivodeship, in north-western Poland. It lies approximately 12 kilometres west of Kołobrzeg and 98 km north-east of the regional capital Szczecin. Dźwirzyno lies between the Bałtyk Sea and the Resko Przymorskie Lake. It is famous for one of the most beautiful beaches on the Coast and one of the cleanest bathing spots in Poland. Al lit makes Dźwirzyno an excellent holiday destination for those who love to relax on the beach, while at the same time offering abundant possibilities of other forms of recreation. Two ports on Lake Resko Przymorskie offer yachts, canoes and motorboats for rent as well as giving the opportunity to practise windsurfing. There are also good conditions to go angling since salmon, trout, sander, perch and eel are to found. For more practical information on visiting Poland visit www.poland.travel/en/plan-your-trip/about-poland or www.lonelyplanet.com/poland. Travel arrangements and costs are the responsibility of the Conference participants. Please, check below for further information on your trip planning. Accommodation will be provided free of charge for the Associated Partners and members of a regional stakeholder body groups (representatives of coastal municipalities, angling associations and tourism associations who support sustainable angling tourism boosting coastal development, and who could benefit from exchange of knowledge and acknowledge of final results of the project) of the CATCH project. for other accommodation options please check, eg, at www.booking.com or www.tripadvisor.com. The Green Federation “GAIA” will not reimburse for changes in travel and accommodation expenditures regardless of the cause, including the cancellation of the Conference. 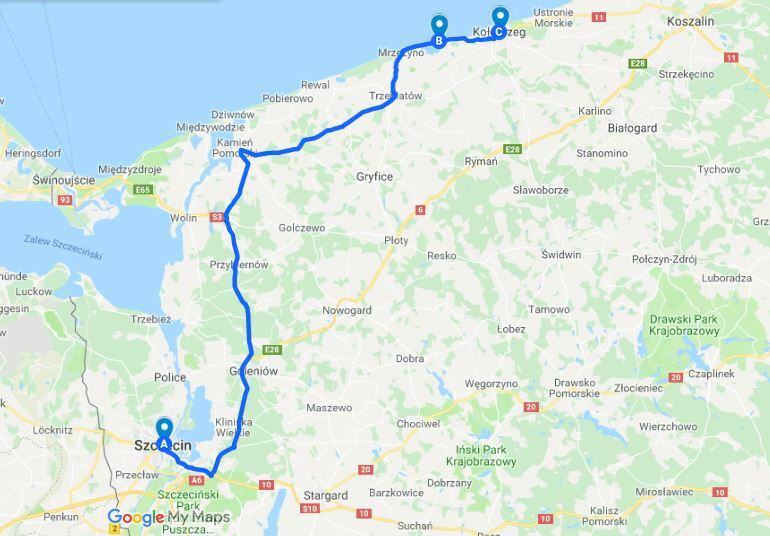 The easiest and most convenient way to reach Dźwirzyno is to travel via Szczecin and Kołobrzeg, from where you can go by train, bus or taxi. To plan your trip by train check www.rozklad-pkp.pl/en, and by bus – www.en.e-podroznik.pl. Szczecin – Goleniów airport (SZZ) is located 38 km from Szczecin. Airport pick-up service include taxi available from outside the terminal, estimated travel time 30 minutes and cost – 30 EUR. There is also a shuttle bus departs the terminal to the main city bus station, estimated travel time 1 hour and cost – 5 EUR. Train station is located just 300 m from the terminal. Berlin airports (Schönefeld: SXF, Tegel: TXL) are located 150 km away from the Szczecin. Airport pick-up service: taxi – 2h, 90 EUR; shuttle bus – 3.5h, 20 EUR/person (earlier booking is suggested). Szczecin can be reached Szczecin from Sweden (Ystad) and Denmark (Copenhagen) using the ferry connections to and from Świnoujście. From there, the journey by bus or train to Szczecin takes about 1.5 hours. Buses from Kołobrzeg starts from the bus stop at Kolejowa St. (in front of the main train station). Bus stop “Dźwirzyno Senator” is in front of the HOTEL Senator. To check timetable for the stop “Kołobrzeg Kolejowa” visit www.expressbus.kolobrzeg.pl/tabliczki/1.0.kolobrzeg.kolejowa.html, and for the bus stop “Dźwirzyno Senator” – www.expressbus.kolobrzeg.pl/tabliczki/1.8.dzwirzyno.senator.html. The ticket costs about 1.5 EUR (cash payment). Taxi can by ordered by the HOTEL Senator or caught at the main train/bus station in Kołobrzeg. The cost is about 20 EUR (cash payment). For further trip planning the following website may be used – www.local-life.com/kolobrzeg/guide/travel.